Part One: The Drive North I decided to take two days, travel north a few hours, and hopefully see some nice fall color. Planning any kind of color viewing in Michigan can be tricky as any slight change in the temperamental weather can speed up or delay the color changes. Since our weather has been very warm over the last month, I waited until the second weekend in October to venture out. I drove north to Grayling, then headed west toward Traverse City intending to complete a circuit which would include a trip up Old Mission Peninsula – a narrow strip of land running North and South that bisects Grand Traverse Bay and is known for its orchards. The following day would be spent at Hartwick Pines State Park in the morning before heading back home. 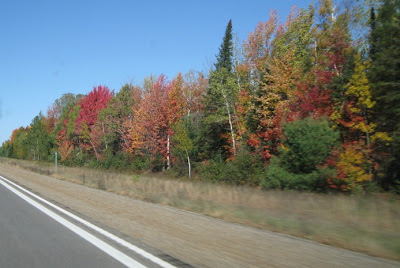 About an hour and a half or so south of Grayling, the color along I-75 started to explode. I admit to being a very bad driver for some of this trip because of all the rubbernecking required to ogle the trees. No matter how many autumn seasons I've enjoyed, I will never be able to get enough fall color. It amazes me. I picked up lunch at Grayling Restaurant – that day's special: Hot turkey sandwich with mashed potatoes and gravy. It was a very windy but relatively warm and sunny day so I decided to eat outside at Au Sable Park. The parks sits on a narrow stretch of the Au Sable River near a couple of canoe liveries. Heading west on M-72 I stopped to photograph a really cool abandoned barn and house in a big empty field of knee-high grass. Unfortunately I am still kicking myself for being a complete sissy and scaring myself out of getting a good look inside the barn. I approached the torn-out section and got a brief glimpse of what was probably lots of interesting stuff inside but retreated once horror movie images of things that could happen in abandoned barns in the middle of nowhere assaulted my brain. The house next door was basically demolished inside and all its windows were gone. What happens to places like this and why have they been vacant but still standing for so long? After struggling to keep my tripod and camera still in the high wind I returned to the car to find that another person had pulled off the road to photograph the barn as well. Enjoyed your fall photos! The barn photo was great too! Isn't hartwick pines state park nice? We go there at least every other month when we're up at our cabin - they always seem to have something going on.